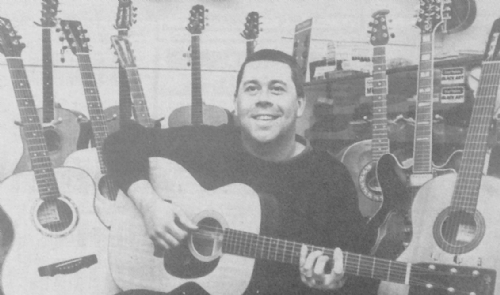 On October 4, 1992, Pete Oakley opened up his first music store in two spare rooms on the high street in Burton. ​​As a collector, recording artist and performer, Pete has always offered a wealth of valuable advise and guidance to cater for guitarists and acoustic musicians at every level, from beginner to full professional. Above. Here's Pete in 1992. Right. 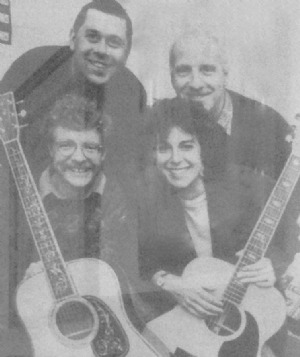 Pete pictured with CF Martin IV president of Martin Guitars USA, Diana Ponzlo Singer Songwriter and Phil York of Dreadnought Guitars at an in-store Martin Promotion. "I've always tried to do right by people, and hopefully that has come across"
1999 saw the launch of the Guitar Superstore website, with a huge selection of products added to the web, and we started shipping them out all over the UK, Europe and beyond! "One of the key factors to Guitar Superstore's longevity is that the businesses has embraced the internet - and embraced it early on around the advent of the internet. We have reacted to people's expectations of what our business can do the internet has become a really important part of the business now." As the business has grown, the shop has expanded substantially in size over the years. Most recently, we moved into our super-sized premises on Station Street in Burton on Trent in July 2016 and now we have a huge amount of guitars we on display! "We estimate that the store holds around 1,000 different electric and acoustic guitars at any one time." Pete started out by himself, but now has a loyal, rock and roll team behind him. Each member of the team is an experienced gigging musician, who can offer a wealth of knowledge, and skills to every customer. We're here to help! From our Burton on Trent store and online shop, we offer a huge selection of guitars, amps, percussion, pro audio, keyboards, synthesizers, recording equipment, PA systems, music accessories and much more. Our team includes experienced guitar technicians who can repair, upgrade and service your guitars to perfection. Pete and the team check over every product, and pick out only the best brands and models to sell to our customers. Here's to 25 years of rock & roll! 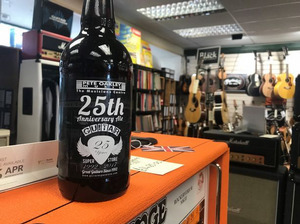 Beer brewed specially to celebrate our 25th Anniversary - CHEERS!